Unexpected charges are something we all want to avoid. You’ve planned your costs and then, often through no fault of your own, an event happens and you’re faced with extra charges. Detention from late container returns is one of the most frustrating. It makes it even more difficult when you cannot even physically return the container. Recently, severe weather at the Port saw important safety measures put in place, such as the closure of some empty parks. The backlog of returns the next day, added to park clean up activities, which some operators faced even further delays. In Force Majeure or other major instances, they will generally give consideration to reasonable requests. It’s best to be proactive and call to see if they can assist. Reasonable extensions may be considered. They will not consider a request where something like a one day delay leads to a request for long extensions. They will not extend any arrangement with anyone who is not a party to the “contract”. It is the customer who is paying the bills, with whom the line has the commercial relationship, who needs to have the discussion with the line. Once you’ve considered all the alternatives, if you still need to, contact the line as soon as possible. 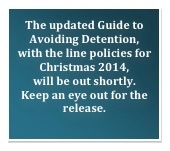 It is much more difficult to get an extension of detention after it has already expired. Finally, as we get closer to peak season, the Port Operations Task Force is updating the “Guide to Industry – Applying for shipping line detention fee relief”. As soon as the information is available from the shipping lines for this Christmas, industry will be informed of the update. Be watching.